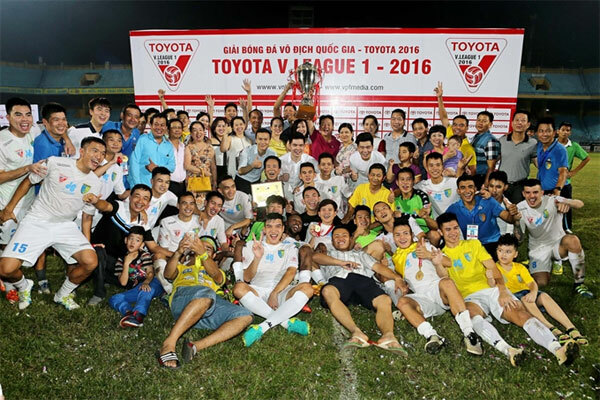 VietNamNet Bridge – Ha Noi T&T are king of the V.League 2016 after their 2-0 victory over FLC Thanh Hoa in the final round match of the tournament yesterday (Sept 18) at Hang Day Stadium. The team return to the top after two years finishing in second position, in 2014 and 2015. This is their third time lifting the winners’ trophy, after their glorious 2010 and 2013 seasons. Prior to the round, Ha Noi T&T and Hai Phong were the two top candidates for the title. They both had 47 points, but Ha Noi T&T was in first place due to their better difference in goals. In case of both winning in their last matches, Ha Noi had a greater advantage, as they only needed a win with a minimum result, while Hai Phong must score at least four goals and suffered nothing to win the V.League championship for the first time. However, Gonzalo Damian Marronkle did not make things easy for them. The Argentinean striker scored a double, one in each half of the match, that saw at least two of Ha Noi T&T’s key players on the bench due to injuries. Hai Phong netted three goals on Song Lam Nghe An on their home turf at Cam Pha Stadium. But it was not enough for them this season. And they have to wait for the cup for at least another season, although they had a perfect start and maintained their peak performance throughout most of the tournament. Marronkle opened the score just 17 minutes into the game, with a close-range tap-in after receiving the ball from a corner kick. Ha Noi T&T finished the first half with a 1-0 lead. At the same time, Hai Phong tried hard, but failed, to tear Song Lam Nghe An’s net. Their strikers only started working 10 minutes after the interval. Also, Le Van Thang ‘shot down’ goalkeeper Tran Nguyen Manh with a straight kick out of the penalty area. His teammate, Errol Anthony Stevens, made it 2-0 four minutes later, and Andre Diego Fagan successfully netted at the 75th mark. The title should have been awarded to Hai Phong, had Fagan not missed three threatening chances, when he was clear to score in the wide open goal of Song Lam Nghe An. All efforts by Hai Phong came to nothing when Gonzalo scored the second time in the additional time with a powerful header that keeper Nguyen Thanh Thang failed to respond to. With the same 50 points from 26 matches, Ha Noi T&T won the event with two goals more than Hai Phong, whose supporters ran onto the field after their game and shouted “Hai Phong are the champions” to encourage their beloved team. SHB Da Nang earned their bronze medal after a 4-0 win over relegated Dong Thap at Chi Lang Stadium. Their forward, Sebastian Merlo, tops the scoring list with 21 goals. Quang Ninh Coal, who wasted their chance to win this season in two previous matches, were defeated 1-3 by Sanna Khanh Hoa. Long An, who will battle in the play-off match to avoid relegation, was defeated 2-6 defeat by Quang Nam. Last year’s champions, Becamex Binh Duong, was tied in a goalless match versus Can Tho. They stand at 10th place. Meanwhile, Sai Gon FC beat Hoang Anh Gia Lai 3-1 at Thong Nhat Stadium. Who will be king of V-League 2016?